← Can Vitamin D help with multiple sclerosis? With the recent emergence of the Zika virus in North America, we are all more aware than ever that a mosquito bite may become more than just a pesky annoyance. Pictures that show us the microcephalic effects of Zika on a pregnancy are shocking, and sobering, but that’s only one potential effect of a mosquito bite. Every year, mosquito borne malaria kills half a million people worldwide, although it is still virtually unknown in North America. In thirty years of medical practice, I’ve only treated two cases of malaria, and the original source there was thought to be from infected migrant workers from Central America. The US also has some exposure to other potentially dangerous mosquito borne illnesses such as West Nile virus and dengue fever. West Nile is a gradually growing risk; there were only 213 cases in the US during the first seven months of 2016, although some years have seen over 1000 cases. And dengue hemorrhagic fever has been known to have episodic outbreaks, mostly in Hawaii and Florida. So while getting a mosquito bite is irritating, and may even cause local allergic reactions, in perspective the odds of a serious complication from a mosquito bite have so far been quite small for the average person living in North America. Obviously, women who may become pregnant carry the highest risk group with exposure to the Zika virus, and are the ones who need to take the greatest precautions. But now we also know that infected males can also pass the Zika virus by sexual transmission. Recently it’s been learned that although Zika has been considered a transient illness in non-pregnant adults, animal studies are showing that adult neural stem cells may have long-term consequences after exposure, raising concern for additional brain aging in later life−and who needs more senior moments? Right now, the Zika risk appears to be limited to a few counties in southern Florida, but the Aedes aegypti or Aedes albopictus mosquitoes that carry Zika and West Nile are found in most of the southern half of the US, up toward a line across the nation from Sacramento –> Salt Lake –> Denver –> St. Louis and then up the Eastern seaboard as far as New York City. Since the potential risk from a mosquito bite has risen the last 5-10 years, and is heading up, let’s explore what we can do to get these bloodsucking bugs to back off. The first step to keeping mosquitoes at bay is to keep their home base as far from yours as possible. Start by eliminating standing water within 150 feet of where you spend most of your time. Pots, buckets, garbage cans, birdbaths, non-draining gutters, or anything that can collect a pocket of water are a magnet for breeding mosquitoes. Pools with chlorinated water are not a problem. You may not be able to clear mosquitoes from nearby properties, but by eliminating local standing water you can reduce their numbers drastically. Share this concept with your neighbors, and do both of yourselves a favor. Know when they are out and about. So why do mosquitoes bite? It’s nothing personal, they are just looking for a meal. The females of the species, the only ones who bite, are looking for protein from your blood which they need to fuel their egg production. They rely mainly on smell and somewhat on sight to choose their targets. We have learned a fair amount about what they look for in a target, which can help you avoid being one. Typically, mosquitoes feed at twilight, either dawn or dusk, and at night, so for most of us, the greatest risk of a bite is in the early to mid-evening hours. As the day cools down, it may make sense to don longer pants and full sleeve shirts to reduce your risk. 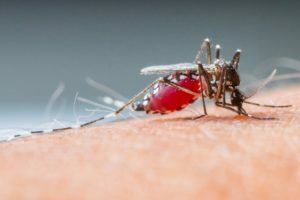 Unfortunately, the species most likely to spread Zika can feed throughout the day, so for now if you live in the southeast coastal US you need to consider taking precautions all day long, especially in the ‘mosquito season’ of May through September. Although mosquitoes use smell over sight for target acquisition, especially in the later afternoon, they do have specific color preferences. They are attracted to darker colors like red, black, brown and blue. Consider wearing lighter colors, especially at peak feeding hours such as dusk. It has been found that tight clothing like spandex and yoga pants won’t block a bite. Choose baggier clothes that let your skin breathe, while keeping the mosquito’s snout farther from your skin. Putting EPA approved deterrents like DEET and permethrin in or on those clothes will extend this protective aura. Make sure that you apply a repellent after and over any sunscreen you use. -carbon dioxide, which we exhale when we breath. This explains why mosquitoes bite adults more than children, and tend to swarm ‘bout your head, where you are exhaling. It also makes pregnant women a target, as they exhale about 20% more CO2 per breath. Their being ~1.25 degrees warmer on average doesn’t help, either, as the critters love a warm body. -your skin bacteria. Our genes code for which bacteria we tolerate and colonize on the skin. Maybe that explains why stinky feet syndrome runs in some families. And wouldn’t you know it, the Aedes species that transmits the Zika virus love the smell of feet; as well as ankles and wrists, which are all bacteria dense areas. -sweat related odors, including lactic acid; especially when combined with bacteria. The longer you wear your sweat, the more attractive it is, so if you are exercising outdoors you should wash and rinse before stretching out to take a rest break. -odors related to your blood type. Mosquitoes favor Type O blood, biting their owners twice as often as the other 55% of the population. Since you are stuck with your blood type for life, Type Os will have to work the other smell factors toward their favor. Another interesting but non-fixable factor is that ~85% of us secrete a chemical signal in sweat that advertises our blood type. So if you are one of the 15% Type O ‘non-secretors’ you may be off the hook as being too bite friendly. -there is another factor that is less well-defined, in that are there are skin chemicals some of us produce that repel mosquitoes. Someday we hope to determine which natural chemicals do this best, and develop them as mosquito repellents. -DEET, applied every 1-2 hours for the 10% version, or every 3-4 hours for the 20-25% concentration. Don’t spray it on the face, rather use your fingers to rub it in. DEET has been used and tested for over 60 years, and there is no evidence of meaningful adverse reactions, including in pregnancy. -Picaridin, found in brands like Sawyer products or ‘Skin So Soft with Picaridin’ may keep the bugs from landing, as well as biting. -permethrin, when applied to clothing as a repellent is especially helpful if you have to be foraging about in the yard or woods. -oil of lemon eucalyptus, which has a pleasant smell and has been found to be about as effective as DEET, for those who want a more natural repellent product. -finally, Victoria’s Secret ‘Bombshell’ fragrance works pretty well, but this choice might be a bit overpowering if applied liberally. -Masking the local human scent, and making the mosquito think you’re a plant, not a person. Citronella causes an odor distraction for the mosquito, making it harder for them to find a human target. Burning a citronella candle within 6 feet buys an umbrella of scent confusion that sends the mosquito off looking for a more defined target, like, maybe your brother-in-law? Currently the risk of a mosquito bite carrying serious disease is generally quite low. Nonetheless, if you live in a more mosquito prone area, particularly the Southern coastal US; are in that lucky ‘high attractor’ group; and especially if you or your spouse are pregnant or considering pregnancy, you should consider taking some or all of the precautions we’ve discussed above. This entry was posted in Doctor's Corner and tagged mosquito bites, Zika virus. Bookmark the permalink.